For the benefit of novice growers I should explain that a back-bulb is a bulb that has lost all its leaves, hopefully because of age rather than disease. 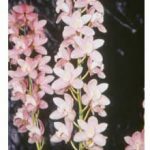 When a cymbidium is repotted, it’s desirable to remove these leafless bulbs, preferably by severing the rhizome linking them to the rest of the plant. It’s best to use a sterile knife or scissors, but some growers simply twist the connecting rhizome by hand until it breaks. Having removed the back-bulbs, how do you ‘strike’ them and why? ‘Striking’ is jargon for encouraging the back-bulb to produce new growth from incipient leaf nodes, which are mostly located near the base of the bulb. To prepare a back-bulb for ‘striking’ first remove any old leaf husks, as these may harbour scale and other insect pests. Then cut any residual roots back to their junction with the back-bulb and trim the break if the bulb was removed by twisting. To minimise infection by any of the organisms responsible for rot the cut surfaces should be sealed, either with Steri-Prune® (or similar sealing paste) or by leaving the bulb lying in the shade for a few days for the cut surfaces to form a scab or callus. Alternatively the cut surfaces can be dusted with a fungicide. Leaving the back-bulbs to dry for a few days is the simplest option. There are many different ways of striking back-bulbs. I’ve used several different methods, each with a fair measure of success. The simplest method, involving least effort, is simply to bury the back-bulb to two thirds of its depth in the same potting medium that you use for the rest of your collection. If you use a 4-in pot then no attention will be needed for two years except regular watering and the addition of a little slow release fertiliser in spring. Some back-bulbs strike more rapidly than others. If a leaf growth appears within three months you’re doing well, while six months would be average. If there’s no sign of growth within twelve months all but the super-optimist should give up (there are always a few back-bulbs each year that fail to strike). Generally, roots do not appear until the leaf growth is several inches tall, and there is no point in applying slow-release fertiliser until this stage is reached. If you’re keen, there may be some benefit in applying liquid fertiliser to the foliage at an earlier stage as liquid fertilisers are absorbed by leaves as well as by roots. 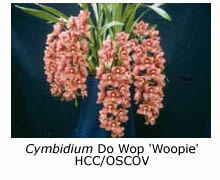 In recent years I’ve struck back-bulbs of my more highly valued cymbidiums using Sphagnum moss as the potting medium. This method seems to produce more rapid growth, but that’s probably because I place the pots in my heated glass-house during winter. After about a year the moss is removed and replaced with conventional cymbidium mix. A modified version of this method has been used by some growers for many years. The back-bulbs are placed in a plastic bag with a little very wet Sphagnum moss and the bag is then sealed and hung in the shade-house. 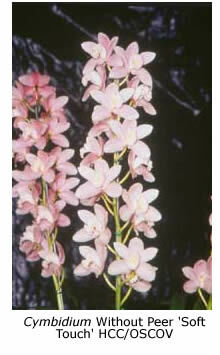 The struck back-bulbs are potted in cymbidium mix when the leaves and roots are a few inches long. The old back-bulb eventually rots and it should be removed from the new plant as soon as rot is detected. While the bulb is in good condition it provides the plant with nutrients, so it’s best to leave it attached as long as possible. However, some growers remove the old back-bulb as soon as the new plant appears able to support itself and then attempt to make it strike a second time. This often works, particularly with large back-bulbs, although the chances of the bulb rotting during its second year are much greater, of course. So, novice grower, now you know how to increase your cymbidium collection. 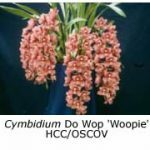 But be warned – it takes four years on average for the new plant to reach flowering size and if you strike all your back-bulbs you will soon have to move to larger premises!